Recently, Jeff Gernitis, purchased The Pilot House, a musty old seafood house in Cape May, NJ, on the Jersey shore. Jeff and his partners kept the restaurant operating for several months while formulating a rebrand plan. During this time they set about familiarizing themselves with the nuances of the location on Washington Street Mall a pedestrian promenade of shops and restaurants, about a mile away from the oceanfront front site of the iconic Peter Shields Inn & Restaurant which they also own. This was invaluable because while operating as the Pilot House they were able to answer many questions, test theories and menu items and spare injury to the future brand as mistakes and miscalculations were absorbed by the old Pilot House brand. I was happy to receive a call from these savvy owner operators when they were in the market for an experienced Restaurant Designer who would think outside the box while being pragmatic about the actual function of the operations and its ability to efficiently accommodate the huge volume of customers the summer season brings. The old “fried seafood combo platter” menu format was tossed and replaced with a more contemporary “fresh fish” & “local ingredients” type menu developed by Chef Carl Messick. Gernitis gave me free reign in the conceptual theme and functional details of the restaurant design and I took full advantage of his confidence. I decided to exploit the city’s excellent reputation as a tourist destination by creating a concept that would propel the restaurant to the top of the town's “Top Must-See Tourist Attractions List” and one that would appeal to all ages. If an hour and half wait for a table at 7PM on a Wednesday evening is any indication, this goal was most certainly accomplished! The entire restaurant space was gutted to "open concept status" and then large design elements such as two 12’ aquarium-walls and a 10’ see-thru stainless steel and barn-wood fireplace were custom built and installed to break-up the vastness of the space, separate the bar from dining areas, and enable the operators to shrink & enlarge the space as needed depending on the day of the week and time of year. Ultimately 700 linear feet of soft, dramatic and glowing LED lighting, detailed architectural craftsmanship and quality finishes were used to create the Casual & Contemporary Aquatic Theme. This restaurant designer was going all out! All good rebrands begin with a "good plan" that should remain fluid during the conceptual process. Below is version #19 of the FINS FLOOR PLAN, which means it was revised 19 times! The old Pilot House was closed and the interior furniture removed and then the space was gutted providing the Restaurant Designer Raymond Haldeman with unlimited options for the functional and decorative design of the space. The SEE-THRU FIREPLACE is flanked by a pair of 2-toned “Alice in Wonderland” type chairs that Haldeman designed for picture taking (and all night long people are having their pictures taken in those chairs!) The photo below of a recent restaurant guest illustrates the large scale. A pair of Giant 4’ Infinity Port Holes designed to create an optical illusion that they continue infinitely separates two dining areas. 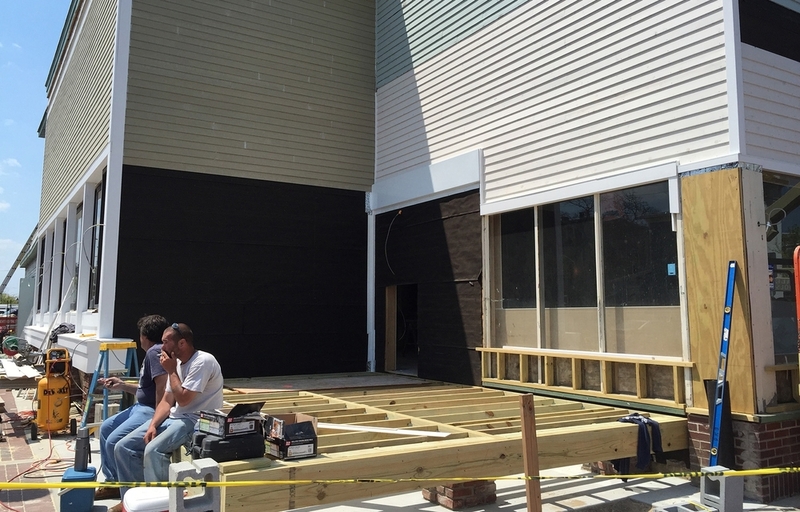 An outdoor deck was created after demolishing an awkward lobby type structure and awnings and fans were added. -All photos on this page are high resolution 300dpi and suitable for publication.